Buffers in dairy rations are compounds that neutralize excess acid within the animal’s digestive system. They supplement the cow’s natural buffers that occur in saliva and increase her ability to overcome the harmful effects of too much acid production. Technically, buffers and alkalizers differ. A buffer maintains the acidity level, or pH, within a narrow range when either an acid or a base is added. Examples of commonly used buffers are sodium bicarbonate and sodium sesquicarbonate. An alkalizer raises the pH in direct proportion to the amount added. Magnesium oxide and magnesium hydroxide are good examples of an alkalizer. Both buffers and alkalizers are important for neutralizing excess acidity and both are called buffers in common usage. Why Does the Dairyman Need a Buffer? The emphasis on increased production and efficiency in dairy cows has led to the increased use of high concentrate or high energy rations. These rations contain more readily fermentable starch which results in increased acid production in the rumen and subsequent acidosis. Also, rations with lower fiber levels result in less chewing time and reduced production of saliva with its natural buffers. What are the Effects of Acidosis? Too much acidity can reduce feed intake, decrease ration digestibility, lower milk production and decrease butterfat test. 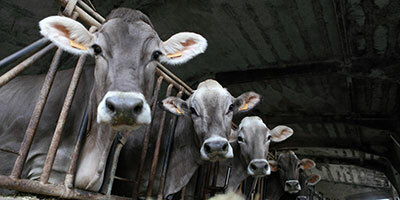 Excess rumen acidity also endangers cow health. Ruminal acidosis can bring on fatty liver syndrome, liver abscesses, rumenitis and laminitis. When excess acidity may be a problem, addition of a buffer is good insurance. When Should a Supplemental Buffer be Fed? High corn silage rations---These are high in moisture and soluble carbohydrates and are low in pH. These factors combined with less salivary secretion can lead to more acidity in the rumen. Wet rations with fermented feeds---Fermented rations depress total dry matter intake. Lower fiber rations---Lower fiber rations depress rumination and result in depressed feed intake and lower butterfat percentage. Fine chopped haylage---Results in reduced chewing time and lower fiber digestion in the rumen. Buffers can help maintain intake and digestion. High concentrate rations---High levels of starch can be fermented rapidly and lead to subclinical acidosis. Early lactation/ high production---Buffers help make the transition to high concentrate rations after calving. The risk of acidosis is greatest at this time. Heat stress---Heat stress can reduce dry matter intake and affect electrolyte balance. Buffers can help restore feed intake and replace lost electrolytes. Low fat test---Research shows that buffers help restore a depressed fat test. Fat test variation of individual cows may be concealed by a normal herd average. Watch for individuals having a protein percentage higher than the fat test. What Kind of Buffer is Best? Buffering the ration with sodium bicarbonate can help greatly to overcome the effects of excess acidity. However, tests show that feeding a combination of MAGOX and sodium bicarbonate can maintain a more desirable rumen pH and improve milk yield and butterfat test more than sodium bicarbonate alone. Two university trials (Erdman, et al.,1980 & 1982) compared MAGOX alone, sodium bicarbonate alone and a combination of the two in cows during the first 8 or 12 weeks of lactation. Rations contained 60% concentrate and 40% corn silage dry matter. Cows fed the combination buffer with MAGOX maintained their rumen pH in the near ideal range of 6.2 to 6.8, higher than cows fed either single buffer (figure 1). Also, those fed the combination produced more milk and maintained a higher fat test than those fed either single buffer alone (table 1). Feeding Magox along with sodium bicarbonate in these trials gave an economic advantage of $0.95 per head per day in return over feed costs. A review of 9 dairy trials in Michigan and 10 trials in Hawaii (Thomas et al.) compared feeding different quantities of bicarb and MgO to cows fed a high-grain diet. Figure 2 shows that the relative increase in milk fat percentage was greatest when feeding 0.6 lb bicarb and 0.3 lb MgO while the greatest quantity of milk fat per day occurred with 0.4 lb bicarb and 0.2 lb MgO. From these trials the best combination appears to be in the range of 0.50 lb bicarb and 0.25 lb MgO. Other tests using acidic diets such as corn silage found the best levels to feed were 0.75% bicarb (about 0.40-0.50 lb) and 0.375% magnesium oxide (about 0.25 lb). Rations that utilize a blended "buffer pack" should contain two parts sodium bicarbonate or sodium sesquicarbonate for each one part magnesium oxide, or a 2:1 ratio, for best performance. Are all Magnesium Oxide Sources Alike? Some believe that one magnesium oxide source is as good as the next and formulate buffers only based upon the Mg percentage. However, research shows there are differences in the effectiveness of MgO sources. After cows consume a high grain, high energy ration the rumen pH drops to its lowest point in 4 to 6 hours, relatively quickly. Before a material can exert any buffering effect, it must become soluble in the aqueous phase of the system. Florida researchers (Beede, et al.) compared several commercial feed grade magnesium oxides for their solubilities in vitro (ruminal and abomasal system) which simulated first the rumen then the abomasum or true stomach. Magox Feed Grade was more soluble in both conditions than any other source. Compared to Magox, other magnesium oxide sources were only 50% to 81% as soluble (table 2). Research with rumen fistulated animals confirms these differences in MgO solubility. Purdue researchers (Noller, et al.) fed steers 150 grams per day of three MgO sources with different rates of reactivity and measured the amount of soluble Mg in the rumen fluid at 5 hours after feeding. Magox, with the highest reactivity rate, resulted in the most rumen soluble Mg. Compared to Magox, prilled 58% MgO, with the lowest reactivity rate, was only 29% as soluble. The MgO source with intermediate reactivity was 73% as soluble as Magox. Rumen buffers and alkalizers are essential in many situations for cows fed high energy rations. While sodium bicarbonate is effective for this purpose, the addition of magnesium oxide greatly improves the rumen environment and helps to restore normal butterfat levels. Research trials prove that MAGOX is more readily soluble than other MgO sources in the rumen so that it is more readily available for use as a buffer. Beede, D.K., E.M. Hirchert, D.S. Lough, W.K. Sanchez and C. Wang. 1989. Solubility of Magnesium from Feed Grade Sources in an in vitro + Abomasal System. Proc. Florida Dairy Prodn. Conf. Erdman, R.A., R.L. Botts, R.W. Hemken and L.S. Bull. 1980. Effect of Dietary Sodium Bicarbonate and Magnesium Oxide on Production and Physiology in Early Lactation. J. Dairy Sci. 63:923. Erdman, R.A., R.W. Hemken and L.S. Bull. 1982. Dietary Sodium Bicarbonate and Magnesium Oxide for Early Postpartum Lactating Dairy Cows: Effects on Production, Acid-Base Metabolism and Digestion. J. Dairy Sci. 65:712. Noller, C.H., L.J. Wheeler and J.A. Patterson. 1985. Feed Grade Magnesium Oxides and Ruminal Concentrations of Magnesium. J. Animal Sci. 61 (Supplement 1):122 (Abstr. ).